What Motivates You to Pursue Smart Personal Finance? I met with a Get Rich Slowly reader at the local coffee house yesterday. Like many of us, Aaron got into money trouble when he was young — he made some dumb mistakes. He fell for a get-rich-quick scheme that left him deep in debt. For a long time, he floundered, struggling to find motivation, but ultimately he found purpose in religion. Aaron's faith helped him to turn his life around, to begin making smart financial decisions. He still has a long way to go, but he feels like the worst is behind him. Too many people hate their jobs but are afraid to leave, because they wouldn't be able to pay their mortgage, credit card bills, car loans, or boat loans. Debt can turn a free, happy person into a bitter human being. Debt can turn you into a slave. For fifteen years, I felt like a slave. Debt was the dominating force in my life. My choices were limited by the fact that I owed tens of thousands of dollars. For a long time, this burden only weakened me — I took on more debt in a futile attempt to ease the pain with more stuff. Eventually I realized that what I wanted was freedom — freedom to work and live where I wanted, freedom to travel, freedom to retire early — and that the only way I could achieve this freedom was by eliminating debt. My non-mortgage debt is gone now, but this desire for freedom remains my primary motivation. It's why I'm willing to live frugally. It's why I want a huge emergency fund. It's why I want to pay off the mortgage. Each of us has a different motivation. Trent at The Simple Dollar credits the birth of his son with helping him to avoid financial armageddon. Trent's young family gives him purpose, gives him a reason to make smart choices. For you, the motivation might be travel, or possessions, or charity, or simply a desire to obtain wealth. Frankly, I don't think it matters what your purpose is — the important thing is to find one. Until I discovered mine, I had no reason to change my behavior because I didn't have a larger goal. It was good to meet Aaron yesterday, and to hear his story. He has a healthy attitude toward the poor choices he made when he was younger. “All of the experiences of our lives — good and bad — make us who we are,” he said. I agree. I no longer regret my mistakes. I see them as a necessary component of who I am today. Without them, I wouldn't have my current motivation to live debt-free. There are 42 reader responses to "What Motivates You to Pursue Smart Personal Finance?". I agree with the idea that debt represents slavery and lack of debt is freedom. One should live for themselves and not to repay their debtors. So long as someone holds power over you and your money, you cannot be free. What motivates me to pursue smart personal finance? I see many of my family members past retirement age or nearing it and will not be able to retire without working. I’m 35 btw which in my eyes does not seem like 65 is a life time away. Seeing other people struggle with debt, family, retirement, etc… definitely motivates me to make sure my finances are taking me where I want to go. My goals to retire early from my job and start my own business are more important than the stuff I could buy now that won’t make me happy. I totally agree that bad experiences are part of who we are and hopefully learning opportunities! Part of it is that economics and finance is just devilishly interesting. Admittedly my degree is in mathematics, so I enjoy solving problems. I just love ‘optimizing’ my situation. I’ve already analyzed what the Bush stimulus plan probably means for my 2008 taxes. It probably means that I should contribute about $850 LESS pre-tax in my retirement savings next year and do something after-tax (like a Roth IRA) with the money instead. I love surprise conclusions. I am of the same mindset as you JD, I DO NOT want to be a slave to debt. 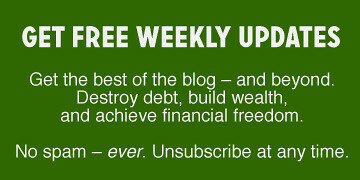 I DO want the freedoms that accompany being debt free and living frugally. And my main motivation is that I want for my spouse to retire early – he has been a wrench bender for 20+ years and a body can’t do that forever. If all plans go well, we will be able to retire by 59 or earlier – yeay!! Excellent post. Too many of us work because we have to, not because we want to or because we enjoy it. My main motivation is that I want to have the freedom to do what I want. I also want to be able to give freely. I can’t do either of those now, because of my dumb mistakes from the past. My motivation is that I finally got tired of going from financial crisis to financial crisis. Also I really enjoy investing and would love to spend alot more time learning about investing but when you don’t have money it’s hard to motivate yourself. My Wife add, the thought of going to Germany (visitng family) without worring about it. My first 3 jobs were all working for people less competant than me. I didn’t have a lot of debt, but I was worried I needed to stay in those jobs in order to advance in life (it’ll look good on my resume). Then I figured out it just wasn’t worth it. Fortunately I was still young – 27 – and I realized I wanted to take control of my life and my finances so I’d never be dependant upon anyone else in my life again. And that’s what I’ve done (or am working on). I was able to leave a job last year when new idiot management came in and replaced the competant old management. It felt so invigorating to say, “I don’t need this, good-bye.” I haven’t missed a beat and better things have come along – all because I was financially prepared to do this. You may not be Christian, but this statement from the Bible can hardly be disputed. Even my Atheist friend agrees with that one. I’ve always had an optimizing mentality so personal finance is a challenge for me. Can I eek out that extra Y% investment return? Can I increase my savings another $X annually? Seems dull to be about to get thrills out of this but it beats being exciting and in debt. I have my emergency fund saved now, and this very morning, I started my IRA with $3000 that would probably have gone directly to eBay before I started reading… if he is ever in Chicago, I owe him a terrific lunch! That why I call them “debt chains.” I like to think that every dollar paid back is a broken link! I am also of the “debt is slavery” mindset – I make a very nice living, but you wouldn’t know it by looking at my bank statements. Every cent I bring in flows right back out to pay off debt. I don’t want to live like this for the next thirty or forty years. Also, as part of my product development job, I have been able to witness several focus groups with retirees and pre-retirees. Its scary how many people don’t plan for retirement, don’t want to think about how little they have saved, and are hoping that social security, medicare/caid, or death will be the answer. I have been frightened into taking charge of my own financial destiny. I went from being a broke college student to earing twice what I needed to live on. Figuring out how to invest the extra was interesting and a weekly check of how much my investments are worth is entertaining. Sort of like gambling, only with better returns in the long term. For me, I got so tired of not being able to sleep at night thinking about how much debt I had. Sleepless nights will certainly motivate you to make a change in your finances. I have to echo SingleGuyMoney. I’m just sick and tired of the worry. Coupled with the fact that I don’t want to live where I am now and my company won’t let me work out of a home office back home even though I cover 6 states and it would make more sense, I am getting this debt paid off to be able to accept a lower paying position even though I will probably bring home more money! There are a few things that motivate me, but they probably all come back to the sense of calm I get from knowing I have something put away for a rainy day. I like the idea of positively reframing our past. After all, we can’t change it. The best we can do is learn from it, use it as motivation, and continue with our lives. That’s easier to do with some things than others. But one thing you see about a lot of people who’ve succeeded is that they’ve failed along the way. It’s so interesting to me to keep hearing about how many people made these ‘big mistakes’ financially when they were young. That’s the exact opposite of my experience. The biggest mistake I made–*financially speaking, not personally*–was to have kids! Before kids (i.e., before my mid-30s), I had so much savings in the bank that the TELLERS used to stop me and give me advice about getting a financial consultant to help me invest it. Then I got pregnant and then pregnant again…and we bought a house, and we wanted ‘things’ for the kids, and wanted to take them places, and wanted to give them lessons and get them involved in activities, and IT ALL COSTS MONEY. And now we’re in deep, deep debt, and just as you said, ALL my activities are based on what I can and cannot AFFORD to do with my life and my career, and that makes me miserable. My desire to become debt free stems from my parents. My mother died in deep deep debt and my father will not be able to retire without working. I don’t want that. Mostly I don’t want my children to worry about me, the way I worried about my mother and how I still have to worry about my father. Thanks for the book note, J.D. I hadn’t heard of ‘Debt is Slavery’ before (despite devouring all I can on the subject through the local library). I had the experience in the not-so-recent past of having difficulty in a job, and not feeling able to leave without losing my house, my credit rating, and my sanity. It was a difficult but ultimately life-changing time for me. It was incredibly stressful, but looking back now, I’m grateful that it happened! I read Your Money or Your Life last summer, and finally realized that I was going at this all backward: I thought that all I needed to be financially independent was to make more money. Instead, I’ve come to realize that I need to SAVE more of what I already earn, and quit sending so much out to creditors. I started considering how much ‘stuff’ I already have, and how much more I really need. I took a long, hard look at my credit card statements over the past couple of years, and realized that there were only a few items on the statements that had truly brought value and fulfillment to my life. I’m still a long, long way from financial security and independence, but I’m starting to feel like I might actually get there (thanks to your blog and others like it). Waking up one day and finding myself and the ex $725,000 in debt. Very similar to Trent, once my wife was pregnant, I knew we had to make some major changes in our lives. Now our daughter continues to show us everyday how today is never the same as yesterday. I don’t want to worry everyday about rent, food, insurance etc. I want to command my own time and staying out of BAD debt will help. Growing my wealth to increase my life quality and opportunities is what I am focussed on as I celebrate life. I agree the sum of your life shapes who you are. Without my past I wouldn’t be blogging today about wealth etc. i watched the consequences of poor money choices growing up and decided i did not want to live like that. my entire life to date, i have been investing my time and effort into the future (lots of education). to have the things i need now, i have to be smart about how i spend the money. What motivated me was moving to NYC from upstate NY with my then girlfriend, now wife. When your future is upon you, it’s time to make some tough decisions. The reality of the cost of living in NYC certainly shaped my newfound financial habits as well. The planning worked out because we got married (cruise wedding….that’s the way to go), recently moved back upstate, and we’re closing on a house this week. Never in my wildest dreams did I think we’d be starting 2008 in a fantastic house that we’re looking forward to living in for the next 30+ years. For many of us who have had the financial yokes of mistakes of the past, motivation can come from wanting to get rid of those yokes. What about those who are just starting off? Those who would be graduating from college and joining the workforce? Those with clean balance sheets or only with study loans? What motivation should they have and from where should they get it? This is what I am searching for as I want to give my children a very very healthy dose of motivation as they start off. What motivates me to get my financial house in order is the stories of many bloggers such as yourself. I am young (23) with less than $13k in debt (car & student loan but no credit card). It’s easy for me to look at my peers and whine about not having the best clothes or taking trips to Europe. But looking ahead I know I don’t want to be in debt in my 30s. I already have $5k in retirement accounts and other assets. My motivation is not getting caught up in spending and wanting what I can’t afford and then helping others to avoid debt. It’s great to get out of debt but I can’t help but think it would be so much better not to get in it in the beginning. For me, the big catalyst was being in an unhappy marriage to a spender. He basically stopped working and spent lavishly from my income. I guess this would have been okay if I loved my job and never wanted to quit, but the opposite was true. I desperately wanted the freedom to quit but couldn’t at our rate of spending. During the divorce, two things happened. One, I finally had some freedom to do what I wanted to do. Two, knowing that he would get at least half of any assets I built up during the divorce, I put every extra cent toward my student loans instead. As I paid down the balance I got more and more excited about the prospect of being debt-free, and that got me more and more interested in personal finance. Making mistakes when you are younger and having to, literally, pay the price can be a big wake up call. I recall at one time paying most of my income toward debts, and realizing one day while paying bills that my entire life was being spent toward ‘stuff’ that did not bring satisfaction in the long-run. People who are wealthy think about money and finances quite differently. Educating yourself or having that experience where you ‘see the light’ and look at money, life, your goals and dreams differently makes the difference. For us, money represents intangibles such as freedom, security, and peace of mind, rather than ‘stuff’ like mansions, cars, and boats. DH and I were spending what we made, more-or-less, and working at high-tech companies. DH got laid off (why were we surprised?!? ), and it was scary, because we didn’t have an emergency fund, we still owed money on one car, and my salary didn’t cover both of us. He was immediately rehired by another part of the same company, but we made changes — tracking spending, I got a new higher-paying job, we got a smaller apartment we could afford on one paycheck, ate out less, paid off the car, saved money. A few years later, DH was laid off again, for good. When he told me, we both shrugged, and said “could have happened at a worse time”. We weren’t as flush on one salary, but we could cover everything, and we had no debt. DH had the leisure of looking for a job he wanted. We do not ever want to go back to that feeling of dependency on a job. Sure, we need to work, but losing or leaving any particular job doesn’t scare us anymore — at least in terms of our finances. We never want to go back. I’ve been a slave to my debt for a long time now and the worst part was that I have realized this for a long time. I just didn’t have the motivation to change my ways. Recently though this motivation has crept into my life and now I’m starting to see things a lot clearer. Its funny sometimes where our motivations come from but when they arrive we shouldn’t ignore them, we should use them and get ourselves free. Freedom is exactly what I am looking for right now. I would love to be independantly wealthy but I now know that this starts by becoming debt free. Well, I want more freedom and control over my life, so controlling my money is a must for me. This make me have some interest in personal finance and financial issues. My dad is an accountant and frugal, so that started me on my path. He instilled his ideas about money into me through action rather than lectures and they stuck. The thought of credit card debt is abhorrent to me, even when it occurs because I don’t have any income. That’s why I’m so determined to get rid of it! My motivation is to be able to work because I want to, not because I have to. I’d love to have the feeling of not worrying if anything goes bad, or that I’m not dependent on a job for my immediate needs. I’ve never had debt, but at the same time, I wish I had more money saved up. I would also love to have a house and pay it off as fast as I can. That way even if I lose my job, at least I’d know I have a roof over my head and no rent or mortgage to worry about. money = freedom is the short answer. For me there are several other motivators to get my financial house in order. One is that I want to do as well as (or better) than my parents did (earn their pride, prove my aptitude, fulfill my potential, etc). Another is that I have expensive taste and I realized that spending beyond my means was only a temporary fix. Between my family and friends there are several wealthy self-made people that motivate me to do better and put my money to work for me. These role models have shown me how saving, investing, and using debt wisely would allow me to eventually have the entire lifestyle to which I aspire. It may seem like envy but actually it really is more about unlocking my potential and using my intellect to claim a share of the pie like playing a real life version of the Game of Life. Thank you for this post! I will be writing my own soon on why I chose to be debt-free, but my reason was/is the same as yours – I wanted to be FREE. Thank you for your inspiration and great writing! My main motivation in being wise with finances is peace of mind. Consider this: after fixed expenses and monthly payments, I don’t exactly have a lot of money to play with. However, thanks to my budget spreadsheet (which also acts as a spending tracker), at least I know where I stand and what action I need to take during each pay period. In reading the magazine which led me to this blog (i.e. the March issue of Real Simple), I found a story which asked readers to rate the frequency of their money worries on a scale of one to ten. Quite a lot of them had high ratings. Me, I’d rate myself a three or four (though I’m known for overestimating things ;-) ). Anger- $53,000 in debt, for what? Vehicles we don’t own anymore, educations in fields that are not hiring, repairs to the old car we have that is near the end of it’s useful life. Opportunity Loss- I saw a house in the paper the other day for $179,000. With the amount of our debts, plus the interest we have paid over years, we could have had half of that paid for. Loss of freedom- I want very much to be able to move back across Canada, to be nearer my family, but we are chained down here with our debts. Also, it would be nice to travel in general.